Phase VII – When the group Breaking Point disbanded in 1975, Van de Guzman formed Phase VII with Hemingway Jasmin. He then set out to complete the lineup for what was then billed as the ultimate “dream” band. Phase VII landed their first gig as the “house band” at Spencecliff’s Hawaiian Hut. They then became the house band at La Boom Boom’s (formerly Duke’s) in the International Market Place. Phase VII’s next venture was traveling and playing the neighbor island circuit starting in Kona and ending in Maui at Kaanapali’s Sugar Mill lounge. 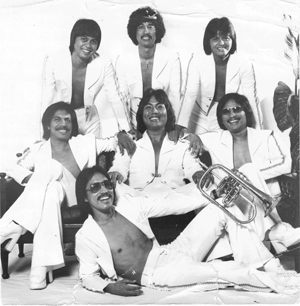 Returning to Honolulu, Phase VII landed a major gig, a first for a local band at the Infinity in the Sheraton Waikiki, who catered to “big time” mainland acts such as the Burgundy Express and the Lewis and Clark Expedition. They moved on to the Jazz Cellar then traveled throughout the west coast starting in Spokane, Wa and ending in Canada. Upon returning to Hawaii, Phase VII went back to the Infinity for a return engagement, and then went back on the road from sun to snow to Fairbanks, Alaska. Tonight the two original founding members of Phase VII Van de Guzman and Hemingway Jasmin, are once again reunited. Please welcome Van de Guzman, Hemingway Jasmin and Phase VII!